In late April we launched our Mid-Year Appeal featuring the story of Mark Unicomb who has been personally touched by the ministry of BCA Field Staff. 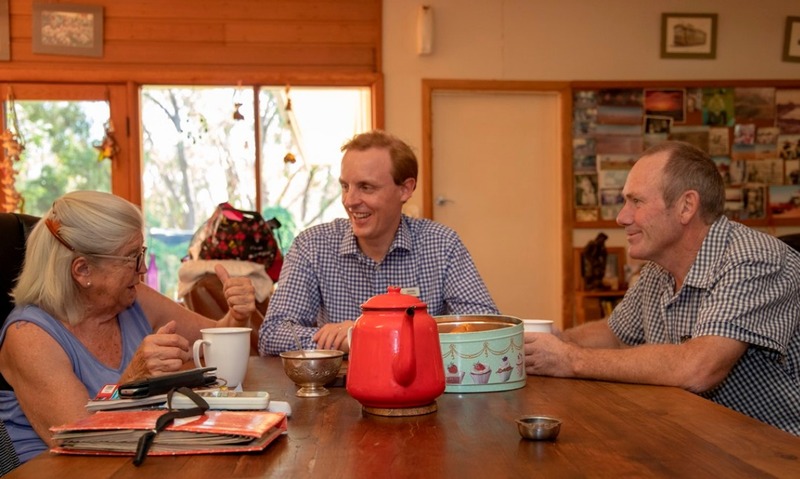 Mark, a member of Narromine and Trangie Anglican Church has been encouraged by BCA Field Staff James Daymond to accompany him in his evangelistic ministry visiting farms right across the district. “The evangelistic ministry of James and Brittany in the Narromine and Trangie area is of utmost importance. People mostly work seven days a week in our farming community and tend to have very little time for anything other than work,” says Mark. “We have visited people on remote farms who have never thought about Jesus or know who He is. Often their first contact with Christianity is when James and I knock on their door. The importance of feet on the ground and personalised visits in regional areas cannot be emphasised enough. People feel more comfortable and receptive to talk about Jesus if they are in their own home. “It is amazing as we watch the power of God work in people we have visited, and see prayer answered as the Holy Spirit works in their lives. Through the help of generous supporters like you, Bush Church Aid will be able to go the distance for another hundred years to bring the good news of Jesus to people across Australia.